KFC’s Newest Colonel Is The Mountain From "Game Of Thrones"
In the latest episode of mind-blowing popular culture and fast food crossovers, Hafþór Júlíus Björnsson, otherwise known as Ser Gregor Clegane, or perhaps, even better known as “The Mountain,” in the widely popular book-series turned television show Game of Thrones takes on the role of Colonel Sanders. The creative shift for the actor sees him decked in Colonel Sanders’ signature threads and overall look: a white suit ensemble and hair joint, complete with the white mustache that has adorned many a food container across the word. In partaking in the campaign, the actor joins the likes of figures such as Jim Gaffigan, Reba McEntire, George Costanza,and Norm MacDonald. Fans of KFC and the actor’s Game of Thrones character will be glad to know that the super strength element is not lost as he can be seen dragging over what seems to be over 500 pounds of KFC sandwiches — the Double Crispy Colonel Sandwich — for a considerable distance. The actor also manages to flex some of his proverbial comedic muscle as he narrates a hopeful anecdote of growing up in Kentucky wanting to “become a strong man” framing his words with his Icelandic accent. You can catch the real-life strong man doing his thing below. 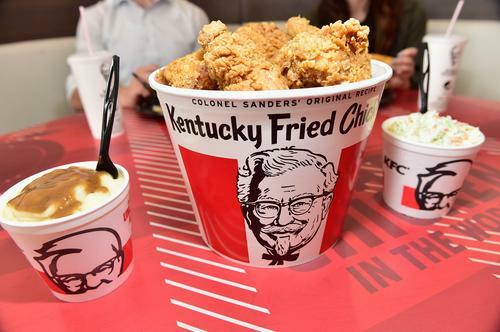 Will you be testing out this massive new KFC sandwich?